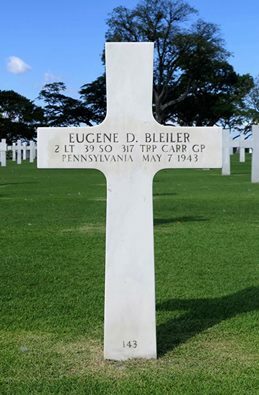 Though 2LT Eugene Bleiler was assigned to 39th/317th, on the day he was killed he was a Student Navigator on a B17F-20-BO 41-24518 "The Reckless Mountain Boys". The ship was on a photo reconnaissance mission when it was attacked by Japanese Zeros. During the attack, the #2 engine was hit, and during subsequent attacks 2LT Bleiler; 2LT Oscar Linsley - Bomb; and SSG Gilber Fleiger -- Gun were killed. The plane crashed landed near Komula Island, offshore on a reef, the dead were buried near by and the remaining crew was eventually captured. Thank You, Mr. Pete Perrine for providing this information to us.